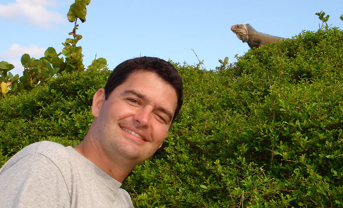 Bryan is a herpetologist who focuses on the biodiversity, systematics, and conservation of amphibians and reptiles. He is especially interested in patterns and processes of speciation. What is a species, and how do we recognize it? Using molecular data and tools from the fields of systematics and phylogeography, he delineates the boundaries within complexes of “cryptic species” (two or more species erroneously classified as single species). His research has shown that many geographically widespread “species” actually contain multiple, divergent, and sometimes sympatric evolutionary lineages that he hypothesizes are distinct species. These findings have implications for biogeography, community ecology, and conservation, and raise questions on how these sympatric lineages originated and are maintained. As a Museum curatorial herpetologist, he devotes considerable time to preparing species descriptions and taxonomic revisions, usually initiated by findings in his field collections. He has maintained an active field program in Southeast Asia since 1998, with a focus on the countries of Laos, Cambodia, Vietnam and Thailand. More recently, the scope of his field work was expanded to include Gabon, central Africa. Closer to home in North Carolina, he is investigating the taxonomic status of an unusual population of the Two-lined Salamander (genus Eurycea), and hybridization between native and invasive slider turtles (Trachemys scripta). To learn more about Bryan's research, please visit www.bryanlstuart.com. Wogan, G. O. U., B. L. Stuart, D. T. Iskandar, and J. A. McGuire. 2016. Deep genetic structure and ecological divergence in a widespread human commensal toad. Biology Letters 12: 20150807. Bell, R. C., R. C. Drewes, A. Channing, V. Gvoždík, J. Kielgast, S. Lötters, B. L. Stuart, and K. R. Zamudio. 2015. Overseas dispersal of Hyperolius reed frogs from Central Africa to the oceanic islands of São Tomé and Príncipe. Journal of Biogeography 42: 65-75. Phimmachak, S., A. Aowphol, and B. L. Stuart. 2015. Morphological and molecular variation in Tylototriton (Caudata: Salamandridae) in Laos, with description of a new species. Zootaxa 4006: 285-310. Stuart, B. L., J. J. L. Rowley, S. Phimmachak, A. Aowphol, and N. Sivongxay. 2014. Salamander protection starts with the newt. Science 346: 1067-1068. Stuart, B. L., J. Rosado, and P. D. Brinkman. 2014. Albert Rogers Crandall’s Smooth Green Snake (Opheodrys vernalis) from North Carolina. Southeastern Naturalist 13(4): N37-N42.